Carpet backing delamination is the most serious problem that occurs with the back of a wall-to-wall carpet. Carpet backing delamination is the separation of the carpets secondary back from its primary back. If the primary and secondary back are not securely attached they can separate. Once a wall-to-wall carpet has delaminated you now have two separate elements consisting of the carpet that has been tufted through the primary back and a loose secondary back. The result will be a wrinkled carpet that cannot be restretched. 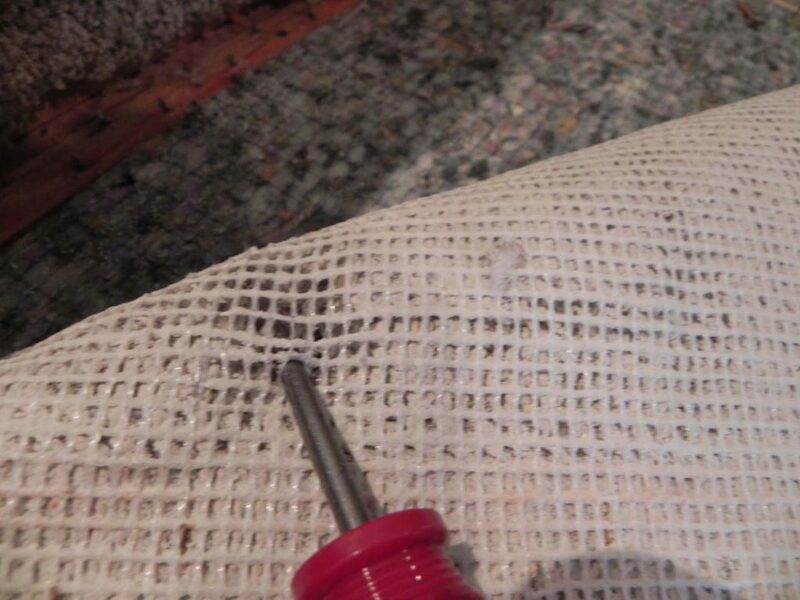 The most common cause of carpet backing delamination is improper formulation or application of the latex adhesive that is used as the bonding agent for the carpets back. Adhesives have builders or fillers in them. If the mixture has been improperly blended or the ratios of the ingredients are out of whack poor adhesion or breakdown can occur. Once the bond fails the primary and secondary back will fail. Commonly this type of separation is a mill defect. Carpet backing delamination can also be caused by use of an excessively thick or low-density cushion (pad). Due to the loss of a good support system a poor carpet pad can result in the carpets back-breaking down. Carpet that was not properly stretched during installation or has lost its stretch can ripple. Anytime carpet ripples are walked over it can break down the latex bonding agent resulting in delamination of the carpets back. Failure to properly seal the seam edges particularly on loop or commercial style carpets will allow a carpet to delaminate easier than it otherwise might. Over use of solvent spotters (especially if directly poured onto the carpet will attack the latex bonding agent resulting in delamination in the area the solvent was used. High traffic over a carpet that has been over wet during cleaning or has suffered water damage can delaminate. This type of delamination is especially true if high traffic is allowed to travel over the carpet while it is still wet. Shrinking or stretching can also occur with carpet that has been over wet during cleaning or water damage. Shrinkage is more common with carpets that have a natural back. Carpets that have a synthetic back are more likely to stretch than to shrink. Both shrinkage and stretching can lead to wrinkling and puckering and when these wrinkles are walked over the backing breaks down. Urine damage from uncontrolled pets or even in a place such as nursing homes where patients may be urinating on the carpet. The urine attacks the latex resulting in carpet backing delamination. Urine damage delamination will usually first be observed at the carpets seams. Break down of carpet backing from rolling carts and rolling equipment. This type of backing separation is most common in the corridors of medical or commercial facilities where a lot of heavy equipment or carts are rolled across a carpet on a regular basis. If you believe that your carpet may have carpet backing delamination and need to determine the cause give a call to the Weinheimer Group. Terry and Kevin are carpet inspector experts. Allen, From the way it sounds you are buying yourself problems and loosing money. Time to either upgrade your thinking, do the job right and start making money or be part of the problem and keep on loosing money when it comes to carpet installation. Perhaps you should check out the CFI – Certified Installers Association, learn the right way to do you job and start making money. John, if the carpet is lifting off the tack strip and the backing is just delaminated along the edge it is probably a fitting problem. If the backing is coming off in large areas it may be a manufacturing problem or cleaning problem. Someone with a bit of expertise would need to see it to tell for sure. Unfortunately, the warranty of most carpet manufacturers excludes stairs. I have a 12′ x 9′ synthetic carpet remnant that has been edged. I have it sitting on a 1/2 ” thick memory foam pad, and it sits on a tile floor. I wanted the extra cushy pad for extra protection for my toddler. He recently spilled a cup of milk on it, and I thought I cleaned it well. A few days later the smell was horrible, so I rented a carpet cleaner and used Rug Doctor Oxy deep cleaner and Rug Doctor Odor Remover. I cleaned the whole carpet piece, going over the spill area many extra times. When I looked at the back, the smell was still there, and the backing is crumbling apart. After it dries, can fix this delamination? Is there something I can paint on the back? In many areas large box stores like Home Depot and Lowes sell carpet installation supplies. What you need is carpet seaming adhesive also known as seam sealer and edge sealer. This is usually a white colored latex though some brands of sealers are more of a taffy color. Turn your rug back and using a small disposable paint brush, apply this adhesive to the delaminated area and push the backings back together. Allow to dry thoroughly before turning the carpet back or it will stick to your carpet pad.